Chances are small that you’ve heard about Peter Roberts before, unless you belong to the inner circles of England’s south-eastern watch enthusiasts. Although he has quite a resumé, he does not seem to be the guy that is all over the web or actually wants to be all over the web. With 45 years of experience in the watch industry though, you could say he’s a watch vet. Being the first WOSTEP student from the UK, having worked at IWC and Rolex in Switzerland and being the head of repairs at one of the high-end jewellers in London is certainly impressive, but you probably don’t know Peter Roberts from that part of his resumé as well. You might know him being the Technical Director of the Bremont Watch Company. Peter Roberts developed their MB roto-click and the impressive Marine clock. Based on a Valjoux 88 that is completely hand finished, modified with the “Concentrique” mechanism, Peter Roberts designed the “Concentrique” Grand Complication 5 timepiece. 5, because it has 5 hands from the center pinion of the watch, indicating: hours, minutes, chronograph seconds, date and an extra time zone. Only 40 pieces will be made of the “Concentrique” Grand Complication 5. 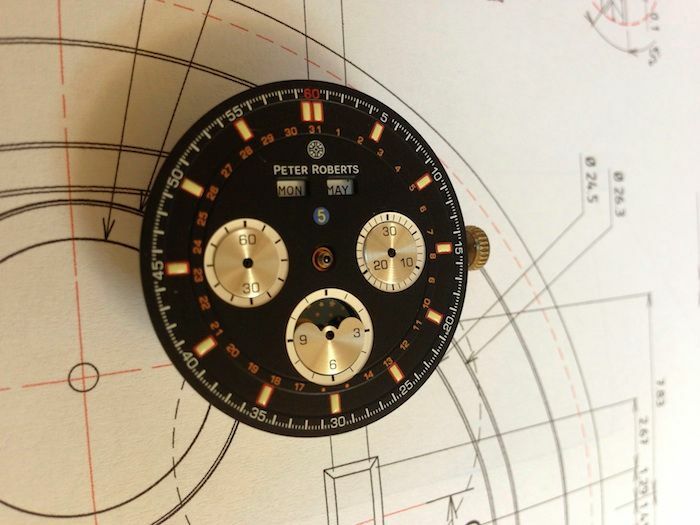 Although you are able to see some generated pictures of the watch on the official website of Peter Roberts, we hereby show you the actual dial of the watch that will be unveiled during Baselworld 2013. We will make sure to come back to you with more details and photos of the Peter Roberts “Concentrique” Grand Complication 5.